Gather with all your Maverick neighbors at the Block Party, which starts at 6 p.m. Thursday, April 16, on Moritz Plaza in the College Park District. Spaniolo Drive will be blocked off between First and Third streets for the end-of-year celebration. The Block Party is free for all students. Enjoy music from the Good Question Band and video DJ, The Throwback Time Machine. Partake of carnival-style treats, games, and activities, such as video games, a photo booth, and airbrush tattoos. Free hot dogs are available, and 26 student organizations and residence halls will have booths for games. If it rains, the whole shebang moves to the Bluebonnet Ballroom of the E.H. Hereford University Center. University Events, Apartment and Residence Life, and EXCEL Campus Activities host the shindig. For more information, contact EXCEL Campus Activities at 817-272-2963 or excel-universityevents@uta.edu. 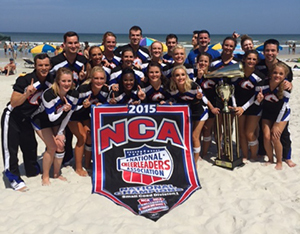 The UTA Cheerleading Squad successfully defended its national championship with another victory at the National Cheerleading Association and National Dance Association Collegiate Cheer and Dance Championship in Daytona Beach, Fla. This is the third all-time national championship for the Mavericks, who competed in the Small Co-ed division. The UTA Dance Team finished sixth in the Challenge Cup of the Dance Open Division I.
Win-win: Members of UT Arlington's winning GeoInstitute teams are, from left, Jorge Jimenez, Manaf Refai, Santiago Caballero, Raju Acharya, Aritra Banerjee, and Minh Tran. 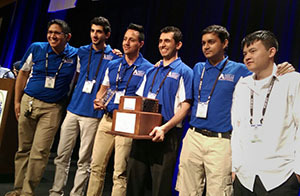 Two UT Arlington civil engineering teams took first and second places in the American Society of Civil Engineers’ GeoInstitute’s national competitions that predicted soil impact on foundation loads and showed strength and stability in geo-wall design and construction. The contests are considered the premier competition events at the national ASCE-GI conference, which was held in San Antonio this month. Raju Acharya, doctoral candidate, led the geo-prediction team, and Santiago Caballero, doctoral candidate, served as captain of the geo-wall team. Team adviser was Anand Puppala, Distinguished Teaching Professor and associate dean for research for the College of Engineering. Read more about the civil engineering teams' honors. A telephone scam first reported in October continues to target students and has resulted in nearly $16,000 in fraudulent payments, the UT Arlington Police Department reports. A caller claims to be from the University, a government agency, or a police department and tries to collect money for unpaid debt. The caller requests payment with the purchase of a gift card or MoneyGram. The caller threatens the individual with arrest and solicits immediate payment for the alleged debts. The telephone number used has been cloned from a legitimate agency or University office. University officials, law enforcement, and government officials will not contact you in this manner or threaten arrest for non-payment of debts. 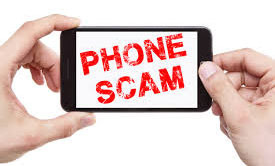 Always be cautious about providing your personal information over the phone especially to individuals who initiate the call. In such cases, always verify the nature of the call and offer to hang up and to call them back at a number they provide. Seek out the organization's official number and contact it directly. If you suspect attempted fraud or fall victim, contact your local law enforcement agency. If you encounter this or similar scams or have information about them, contact the UT Arlington Police at 817-272-3381. Use good judgment and caution when clicking Web or email links or opening attachments. If you receive an email that appears suspicious, send it to security@uta.edu. Do not click on the links or open attachments. Vote today for Student Congress president, vice president, and senators, Mr. and Ms. UTA, UTA Ambassadors, and Student Service Allocation Committee representatives. Polls are open 9 a.m.-6 p.m. today, Tuesday, April 14, in the University Center Gallery in the E.H. Hereford University Center. Students need to bring their UTA student ID to vote. Contact Jennifer Fox at jdfox@uta.edu for more information. About 800 volunteers participated in The Big Event, UTA's day of community service Saturday. 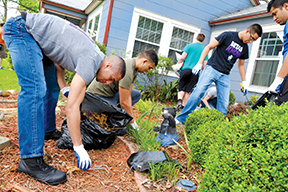 Projects ranged from cleaning up property to assisting nonprofit programs with sorting and organizing. See more photos. During the upgrade of the Identity Management System, you may have noticed changes in the names that display when you send an email. The Office of Information Technology has enabled a feature in MyMav that will allow you to update your email display name. This option in MyMav will update the Global Address Book to show the changes in your name on your email. To update your display name, visit the How to Update Your Display Name webpage. Parking is limited at the UTA Bookstore during its renovations, which include a new Starbucks Café. Complete the required form by noon Tuesday, April 21. The forms are available by email and in the Student Legal Services Office, Room 216, Davis Hall. 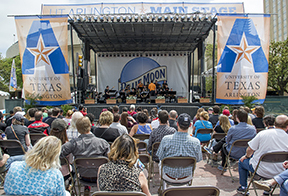 The Main Stage at Main St. Fort Worth Arts Festival sounded off with jazz from UT Arlington musicians Saturday. Alumni and other Maverick fans enjoyed the tunes during the Jazz Brunch in the VIP tent. Those curious about UTA's offerings found answers at the booth, where volunteers provided information and handed out freebies. See more photos. A new policy—Space Heaters and High-Current Small Appliance Use in UT Arlington Facilities, HOP 5-310—has been added to the Handbook of Operating Procedures. The policy provides a process for obtaining permission for their use and protocol for their safe use and operation. Questions? Contact the Office of Facilities Management at 817-272-3571. All titles on the site already are 33 percent off. Faculty, staff, and students will receive a discount of 45 percent off the full retail price. The sale will run through midnight Friday, April 17, on the UT Press website. To receive 45 percent off and free shipping, use the code UTPS15. 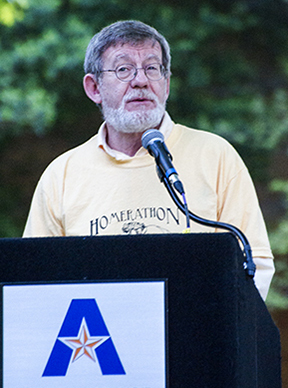 Charles Chiasson, director of classical studies, reads the first passage of "The Odyssey" by Homer at the annual Homerathon on Wednesday. The event is a daylong reading of the Greek classic tale with faculty, staff, students, and community members as volunteer readers and performers. Dr. Chiasson is an associate professor of philosophy and humanities. The UTA Ambassadors are looking for a creative student to repaint one of the fiberglass spirit horses. The deadline to submit a proposal is Thursday, April 16. Visit uta.edu/ambassadors for more information. Contact Jennifer Fox at jdfox@uta.edu with questions. Become a UTA-HOSTS! mentor to a new freshman or transfer student this fall. Share your memorable experiences and pass on the knowledge you learned here in UTA. Apply online and attend a mentor meeting 4-5 p.m. Thursday, April 16, in the Student Congress Chambers in Room B150 of the E.H. Hereford University Center. To become a mentor you must have attended UTA for two semesters and have a cumulative 2.5 GPA. Youngster Jack Lehane virtually visits with Jonathan Kretz via a robot at the National Robotics Week event at the UT Arlington Research Institute. Kretz is director of business development and marketing for UTARI. Similar robots are available for rent in the Central Library. Help fellow students get back on their feet at the 10-hour Dance-A-Thon on Wednesday, April 15, at the indoor soccer field in the Maverick Activities Center. Register a team of six-10 people to raise a goal of $250 per team, then dance the day away. At least one team member must be on the dance floor at all times. All proceeds will be donated to the UTA Student Emergency Assistance Fund. The Freshmen Leaders on Campus sponsors the event. Admission is free before 5 p.m. and $5 per person afterwards. Join the Facebook page to help spread the word. University departments and student organizations may sign up for a table at the upcoming Involvement Fair at New Maverick Orientation for transfer students. The fair starts at 10:45 a.m. Friday, April 17. With each ticket, $5 goes directly to the UTA Student Emergency Assistance Fund. See the gift codes on the website. Use the code UTA. 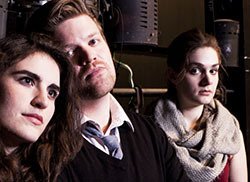 MavPlays 2015 theatre festival features iconic works, edgy new talent, and emerging playwrights with artistic vision. Theatre Arts students direct, perform, and, in some cases, write the plays. The Studio Series performances are Trifles and Waiting for Lefty. Showtimes are 8 p.m. Wednesday, April 15, and Saturday, April 25, and 2:30 p.m. Sunday, April 19. Wrong Turn at Lungfish is 8 p.m. Fridays, April 17 and 24, and 2:30 p.m. Sunday, April 26. All are in the Studio Theatre of the Fine Arts Building. The Collected One-Acts are Homebound, Musical Chairs, and Next Time Let's Go Out To Dinner. Showtimes are 8 p.m. Thursday, April 16, Saturday, April 18, and Thursday, April 23, and 2:30 p.m. Sunday, April 26. Performances are in Stage 143 of the Fine Arts Building. Tickets are $7 for UTA faculty, staff, students, and seniors and $10 for the public. For tickets, contact the Theatre Arts Box Office at 817-272-2669 or uta.edu/theatre. MFA Art Exhibit Master of Fine Arts candidates present a culminating exhibition demonstrating excellence in their chosen fields. Morgan Chivers, Gabriel Duran, Brendan Feltrup-Exum, Christine Heimerman, Emily Nicastro, Maryam Rezaei, and Joshua Wilson showcase their work in film/video, glass, intermedia, and visual communication. Hours 10 a.m.-5 p.m. Mondays-Fridays, noon-5 p.m. Saturdays. The Gallery at UTA, Fine Arts Building. Through Saturday, April 25. The Gallery at UTA. Baseball Mavericks vs. TCU. Tickets $5-7; $3 students. 6:30 p.m. Clay Gould Ballpark. Athletics. One Mic Stand Comedy Series: Sheng Wang Comedian Sheng Wang does stand-up comedy. Free. 7 p.m., Bluebonnet Ballroom, E.H. Hereford University Center. EXCEL Campus Activities. Housing Fair The Shorthorn's Housing Fair brings together apartment communities and housing resources highlighting housing options and how to successfully live on- and off-campus. 10 a.m.-2 p.m., Palo Duro Lounge, E.H. Hereford University Center. The Shorthorn. Guest Artist Recital Wyeth String Quartet performs. Free. 7:30 p.m., Irons Recital Hall, Fine Arts Building. Music. Third Thursday Game Night Video and board games are available, but you can bring your own to share. Free. 6 p.m., basement, Central Library. UT Arlington Libraries. Author Book Signing Author Ben H. Winters reads from his most recent work, World of Trouble, the concluding book in the Last Policeman trilogy. A book signing follows. Free. 7 p.m., Room 100, Nedderman Hall. English. Baseball Mavericks vs. Troy. Tickets $5-7; $3 students. 6:30 p.m. Clay Gould Ballpark. Also, 2 p.m. Saturday, April 18; 1 p.m. Sunday, April 19. Athletics. Friends of the Library James Haley discusses his new book Captive Paradise: A History of Hawaii and the history of Hawaii since its discovery in the late 18th century. RSVP. Free. 7:30-10 p.m., sixth floor parlor, Central Library. Friends of the Library. HBO After Dark: Crawford vs. Dulorme Undefeated WBO world lightweight champion Terence Crawford, the BWAA 2014 Fighter of the Year, takes on top contender Thomas Dulorme. Tickets $25-$200. Doors open at 5:30 p.m., College Park Center. Softball Mavericks vs. Georgia State. Tickets $5-7; $3 students. 1 and 3 p.m. Allan Saxe Field. Also, noon Sunday, April 19. Athletics. Earth Day Learn about the latest in celebrating the Earth at booths for the Environmental Protection Agency, the Fort Worth Native Plant Society, Whole Foods, and many more. The T Master Plan bus will be there. Free plants while available. 11 a.m.-1 p.m., University Center mall. Institute for Sustainability and Global Impact. Friday Night Film: 'American Sniper' Rated PG-13. Free, fresh-popped popcorn while supplies last; other concessions for sale. Tickets $1, $1.50 with credit card. 7 p.m., Rosebud Theatre, E.H. Hereford University Center. EXCEL Campus Activities. Concerts and Recitals Free performances: Symphonic Winds and Symphonic Band Concert, 5 p.m. Sunday, April 26; Faculty Violin Recital: Martha Walvoord, Monday, April 27; String Chamber Ensembles Recital, Tuesday, April 28; Guest Artist Recital: Nick Scales, Friday, May 1. Also, UTA Symphony Orchestra, Saturday, April 25, and UTA Choir Concert, Thursday, April 30; tickets $9 for adults, $5 for students and seniors. All 7:30 p.m. unless noted, Irons Recital Hall, Fine Arts Building. Music. Baseball Tickets $5-7; $3 students. Mavericks vs. Arkansas-Little Rock. 6:30 p.m. Friday, May 1; 2 p.m. Saturday, May 2; 1 p.m. Sunday, May 3. Also vs. Appalachian State, 6:30 p.m. Friday, May 8; 2 p.m. Saturday, May 9; 1 p.m. Sunday, May 10. All at Clay Gould Ballpark. Athletics. Softball Tickets $5-7; $3 students. Mavericks vs. Texas State, 1 and 3 p.m. Saturday, May 2; noon Sunday, May 3. All at Allan Saxe Field. Athletics. Major Exploration Seminar Discuss resources for choosing a major with an adviser. Free. 4 p.m., Room 104, Preston Hall. Also, 2 p.m. Friday, April 24. University College. Mavs Talk: Mindfulness Learn more about mindfulness practices and the benefits of adding mindfulness to your life. Register or join day of event. Free. 2:30-3:30 p.m., Room 104, Preston Hall. Counseling and Psychological Services. CMAS Distinguished Lecture Vicki Ruiz, chair of Chicano/Latino Studies at the University of California, Irvine and president of the American Historical Association, presents "Why Latino History Matters to U.S. History." 7 p.m., sixth floor parlor, Central Library. Center for Mexican American Studies. Safe Zone Ally Training Learn to create a visible network of support for lesbian, gay, bisexual, transgender, questioning individuals, and their allies. Register online. 1-4 p.m., Neches Room, E.H. Hereford University Center. LGBTQA Program. QPR: Suicide Prevention Program Increase awareness of the warning signs, clues, and suicidal communications of people who may be considering suicide, and learn how to intervene with at-risk individuals. Free. 2-4 p.m., Room 104, Preston Hall. Counseling and Psychological Services. New Answers to Research Questions Erik Hinton, an interactive Web developer and assistant design editor at The New York Times, discusses new approaches to footnoting and citation, rapid sharing of archival research, and the presentation of digital photography and artwork. A workshop for graduate students follows. Free. Noon, Room 108, University Hall. History. Advising: Service Learning Service Learning, 11:30 a.m., first floor lobby, Ransom Hall. Also, 1:30 p.m. Thursday, April 23; 10:15 a.m. Friday, April 24. University Advising Center. , 3:30-4:30 p.m. Thursday, April 30, Room 104, Preston Hall. Counseling and Psychological Services. Advising: Prepping for Finals 1:30 p.m. Tuesday, April 28; 11:30 a.m. Thursday, April 30; 10:15 a.m. Friday, May 1. All in first floor lobby, Ransom Hall. University Advising Center. 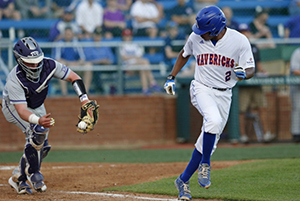 A step ahead: The last time the Mavericks played the Horned Frogs, freshman Christian Hollie helped the team post an 8-1 win March 31. UTA and TCU meet again tonight at Clay Gould Ballpark. The Mavericks welcome sixth-ranked TCU to Clay Gould Ballpark at 6:30 p.m. today, Tuesday, April 14. UTA defeated the Horned Frogs 8-1 earlier this season. The team ended a five-game losing streak Sunday with an 8-3 victory over Georgia Southern in Statesboro, Ga. Sophomore right-hander Joel Kuhnel allowed four hits and three earned runs in eight innings to pick up the win. The Mavericks are 15-19 overall and 6-9 in the Sun Belt Conference. They host Troy in a three-game series beginning Friday, April 17, at Clay Gould Ballpark. UT Arlington is adding women’s golf to its NCAA Division I intercollegiate athletics programs, with competition set to begin in the 2017-18 academic year. The addition marks the first sports expansion for Maverick Athletics since women’s tennis in 1983. The University is beginning a national search for a head coach who will lead the combined men’s and women’s golf programs. Senior Nina Villanueva’s two-run double capped a three-run eighth inning as the softball team defeated Louisiana-Monroe 11-8 on Sunday in Monroe, La. The Mavericks split a doubleheader Saturday against the Warhawks, winning the first game 5-3 in nine innings and losing the second 9-5. UTA is 26-19 overall and 7-8 in Sun Belt Conference play. The 26 wins are the most in a season under third-year coach Kristie Fox. The team plays Texas in Austin on Wednesday, April 15, before returning home for a three-game series against Georgia State beginning Saturday, April 18, at Allan Saxe Field. The women’s tennis team completed its regular season Saturday by defeating North Texas 4-0 at the UTA Tennis Center. The Mavericks are 14-5 overall and 4-0 in the Sun Belt Conference, making it one of their best seasons in the past five years. The women’s and men’s teams compete Thursday-Sunday, April 16-19, in the Sun Belt Conference Championship in New Orleans. • Next up for the men’s and women’s track teams is the Mt. SAC Relays on Wednesday-Saturday, April 15-18, in Walnut, Calif. The teams also compete in the Michael Johnson Classic in Waco on Saturday, April 18. • The golf team travels to Miramar, Fla., on Sunday-Tuesday, April 19-21, for the Sun Belt Conference Championship.